If you haven’t read the first three books in the Fallen series, beware of spoilers below. 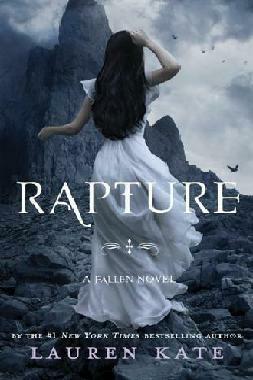 I’ve been dying to read Rapture, the final installment in Lauren Kate’s Fallen series, for the past ten months. I read the first three books last fall and fell in love with the series. They aren’t the best written books or even the most interesting story. There is just something about the Fallen series, namely the characters, that has kept me itching for more. I just could not wait to find out how it would finally end for Daniel and Luce. In the first three books in the series, Luce met and fell in love with Daniel Grigori. What she didn’t realize, but soon came to find out, was that she had been doing the same thing in many different lives since the beginning of time. Daniel, as well as all of the other friends Luce met at boarding school Sword and Cross, were fallen angels, some who had chosen Heaven’s side and others who had chosen Lucifers after the fall. Luce is the curse that was set on David after the fall. He is doomed to meet and fall in love with her over and over again in each of her lives and then, as soon as they would get close, she would inexplicably die. In Rapture, Daniel, Luce and the rest of the fallen angels are in a race against time to find the spot where they fell to earth in order to stop Lucifer from erasing every thing of the past. Now that Luce has seen many of her past lives through the announcers in the third novel, Passion, she has begun to remember more and more from her past lives. In this final book Luce will finally learn everything about herself and Daniel and their love that has been doomed for centuries. Rapture was a satisfying conclusion to a four book series for just one reason. It answered the questions that we had all been dying to know all along. One important answer was left out, I will go further into that below, but the essential questions about Luce, Luce and Daniel, and the fall were all finally answered. After going through three books where because Luce was being kept in the dark about almost everything, readers were equally left in the dark, Rapture finally divulged. That being said, it was a tough book to get through. It took me almost a week to read where as normally when a book I’ve been waiting months to read, especially the final book in a series, comes out I will read it in less than 48 hours. I don’t specifically remember the other books being this way, but the abundance of heavy description bogged down the story for me. Every time the angels flew anywhere, we would have to sit through 2-3 pages of description from Luce of their surroundings before finally getting some type of action. I would not say the writing was bad, it just bored be and led to skimming these parts of the novel. It is a matter of preference more than anything. I like to read books that move fast and don’t waste too much time on description, especially long and unnecessary descriptions of the setting. Ultimately I did enjoy reading Rapture, but at some points I had to tell myself to keep reading knowing it would be worth it in the end. Raptures ending probably brought my rating up from between a four or five to between a six or seven. I was just so pleased with how it ended. Some parts of the ending I guessed and other parts were a complete surprise. After reading the epilogue, I felt Luce and Daniel’s stories were finally complete in my mind. No strings left unraveled in that area, I closed the book with a smile on my face. It was disappointing that Cam’s story was left so literally open-ended. When in the epilogue we are given a look into the future of how Luce and Daniel and their friends ended up, Cam’s name is brought up though no one answers the question of how he is doing and the connotation was that it was not well. He was a major character in all four of the novels, and at the very end his story was absolutely not finished. I loved Cam. I did not want Cam and Luce to end up together, but I still loved him. He (and us readers!!!) deserved more than that. The only reason I can imagine for Lauren Kate to have done this to us is that she has a follow up book involving Cam planned. There is not other plausible explanation in my mind and I will not be satisfied until there is one.